Twice Baked Potatoes are what I like to make when I want to serve a dinner that is a little fancy. Are these hard to make, no. Do they look pretty, and make everything think you are the perfect host, yes. When I was growing up when my Mom was serving up a fancy meal these might come out. I think that twice baked potatoes are a wonderful way to say I care enough to make your dining experience special, so I am going to take care of preparing your potato like you might on your own. What makes a twice baked potato unique? If you enjoy a baked potato, you will love this, it is like a baked potato, but everything is there inside of the potato, and it is even broiled to make a lovely cheese crust on top. This recipe is a very flexible recipe, meaning you really can add whatever you like to this, my go to is butter, sour cream, scallions, bacon, and cheddar cheese. I have also made this with some left over smoked Gouda, and sour cream with great results. I would love to try these with a little left over brie and some grilled onions. If you can find them I really like to use the Yukon gold potatoes for this recipe, I love how the potatoes are naturally buttery. I also find russet potatoes to be a good choice for these. To start this recipe wash the potatoes like you normally do and then give them a rub down with a vegetable oil, you can use olive oil, vegetable oil, or even butter, they will all work very well. You don’t need to poke holes in your potatoes, they will bake nicely without personal intervention. You can make these ahead of time, and serve them up when you have a nice meal. You will have to heat them in a 350 degree oven until warm, this may take 8 to 10 minutes, then top with some additional cheese, turn your oven onto broil and broil until the cheese begins to brown. One note: I get asked this all of the time, “Can you eat potato skins?” You can eat potato skins. Potato skins are edible, and they taste pretty good. 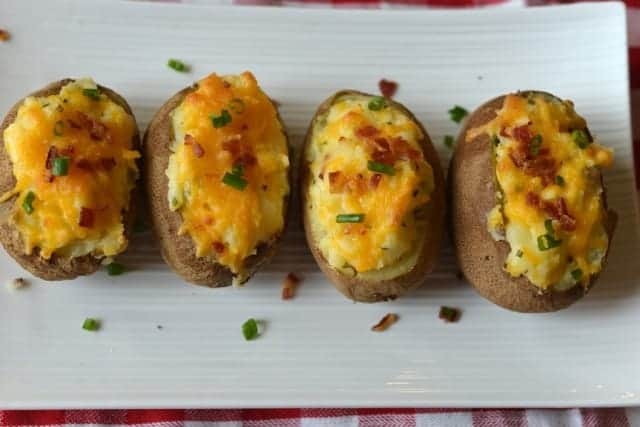 Learn how to make delicious twice baked potatoes. Wash potatoes and dry them. Rub a little vegetable oil on the potatoes and then bake for 45 minutes to 60 minutes or until the potatoes are done (cooking time varies on the size of potato). Cut the top third off of the potato. Place the top meat of the potato into a bowl, and scoop the inside of the potato out. Be sure to leave about 1/4 to 3/8 of an inch around the edge of the potato. Complete with all remaining potatoes. Add warmed butter, sour cream, salt, and pepper to the potatoes. Blend until the potatoes mixture is smooth. Add half of the cheese, half of the scallions, and half of the cooked bacon into the potato mixture. Then fill the potato boats with the potato filling. Fill the potatoes generously with the potato filling. Top the filled potatoes with cheese. Turn the oven onto broil and then broil the potatoes until the cheese turns golden brown. Top the twice baked potatoes with remaining scallions and bacon. These look delicious! Love twice baked potatoes! I love this recipe. Totally going to try it when Braydon visits next month. Your kitchen is freaking gorgeous. I love your cupboards. I never get sick of twice-baked potatoes!! These look delish. I always like to try new dishes ,and by seeing this and reading how it make ,seems to very easy and i think i enjoy to make it in my oven.